The Northern Chumash people live on the magical land that is called San Luis Obispo County. The Chumash are the First Peoples of this land and have thrived as a maritime culture along this coastline enjoying its magnificent beauty. The Chumash are still a vibrant community, practicing their heritage and culture today. 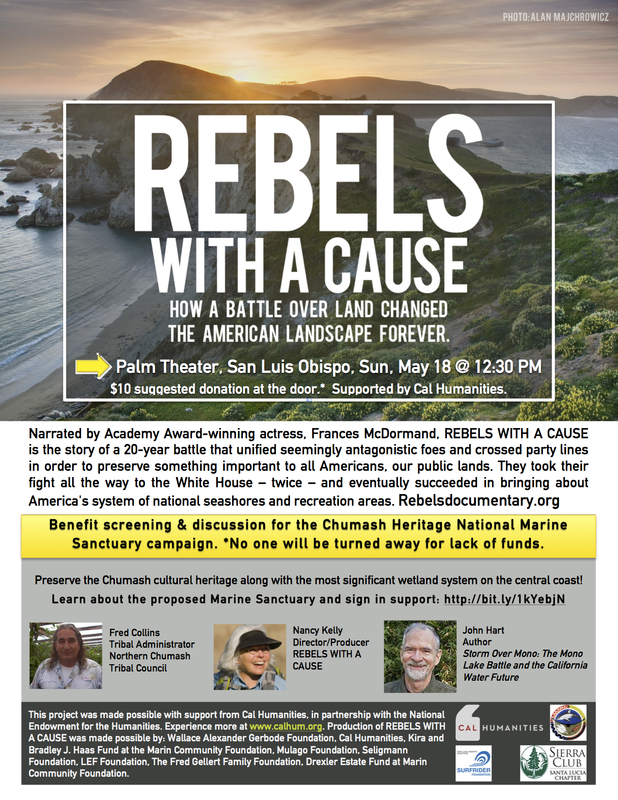 WHAT: Screening of Rebels With A Cause and panel discussion with: Fred Collins (Northern Chumash Tribal Council), Nancy Kelly (Director/Producer, Rebels With A Cause) and John Hart (Author, Storm Over Mono: The Mono Lake Battle and the California Water Future). Community Partners: Northern Chumash Tribal Council, Surfrider Foundation San Luis Obispo Chapter, Sierra Club Santa Lucia Chapter. This event will focus on the proposed Chumash Heritage National Marine Sanctuary.